The photo above is our favorite throwback of First Peak. 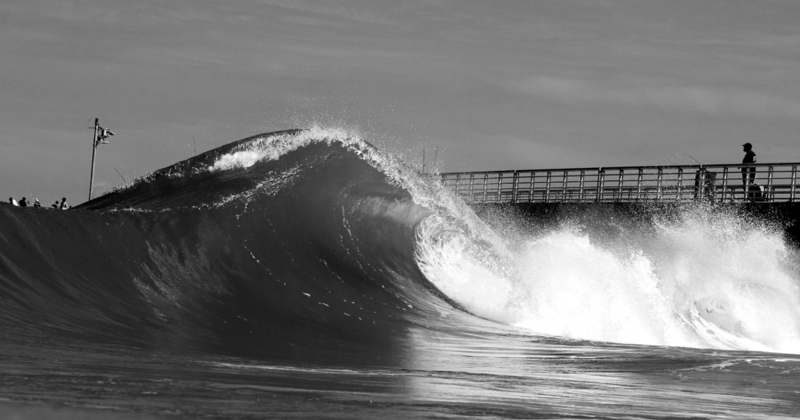 Expert surfing photographer Jimmy Wilson took this shot back in First Peak’s glory days. 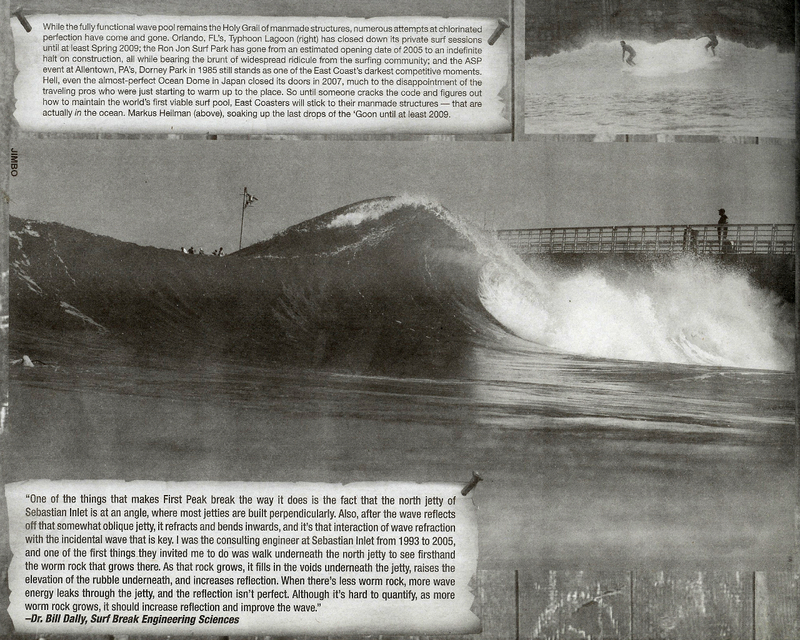 Jimmy dug deep into his archives and sent us the digital proof to help us champion the First Peak Project. It’s a stellar, epic shot because it captured the unique man-made wedge that gave First Peak its name. If you look closely under the lip of the barrel, you’ll notice the smaller reflected wave. The intersection of this reflected wave and the next incident wave is the aquatic alchemy that causes the wave to peak. Coastal engineering calls this process wave-wave interaction. This picture exhibits wave-wave interaction exquisitely. Eastern Surf Magazine originally published this image in a feature entitled Structural Damage (Eastern Surf Issue 130, August 2008).The feature article went on to exhibit a series of man-made waves up and down the East Coast. 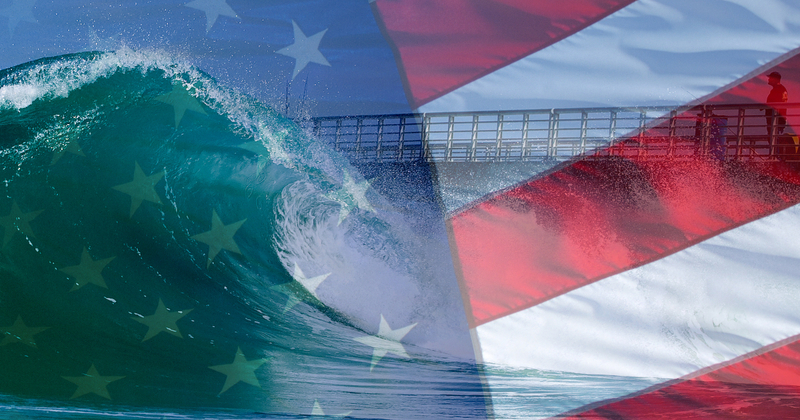 Of course, any article that focuses on man-made waves is going to get us amped. Moreover, it’s ironic to find First Peak in a feature with the title Structural Damage considering the present state of the wave today. Two very fascinating narratives accompany the picture of First Peak. The first references Typhoon Lagoon, Ocean Dome, and the 1985 ASP event in Allentown Pennsylvania. The latter article accounts a professional coastal engineer’s observations of the worm reef that grows along the north jetty. He describes how the presence of worm reef can affect the quality of the surfing wave. We’ve transcribed the article’s narratives below so you can dive into some nostalgia with us. Fast forward to today, over a decade since First Peak disappeared. The juxtaposition of these two narratives portrayed alongside the deceased First Peak sparks some fascinating revelations. For starters, today we live in the age of surf pools. The new wave pool revolution signifies that our knowledge of surfing waves has evolved. 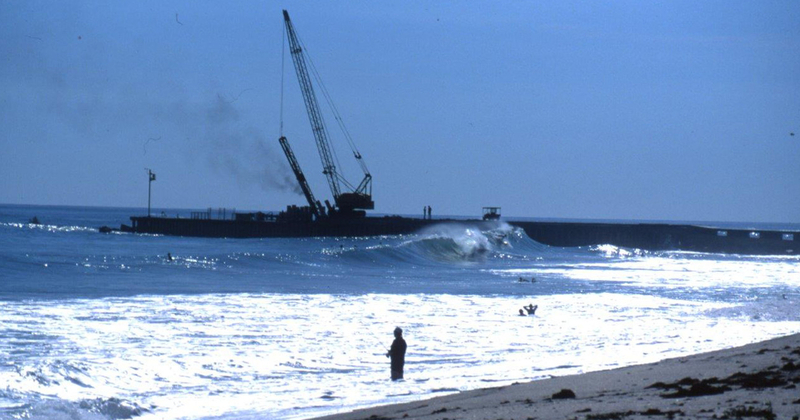 Building man-made surfing waves are not only possible, but it’s happening. The second narrative reveals something even more profound. The quality of the surfing wave varied according to a biological response. The worm reef affected the characteristics of the surfing wave! Not only can we restore First Peak but we can bio-mechanically engineer an eco-friendly solution. No picking up and putting down rocks already at Sebastian Inlet. No dumping tons of concrete or other material. No dredging. It’s all about growing worms. We can regrow First Peak. The world needs environmental stewardship. We need more methods and ideas that grow the economy while preserving the natural environment. Furthermore, we need ways to create more jobs at the same time. 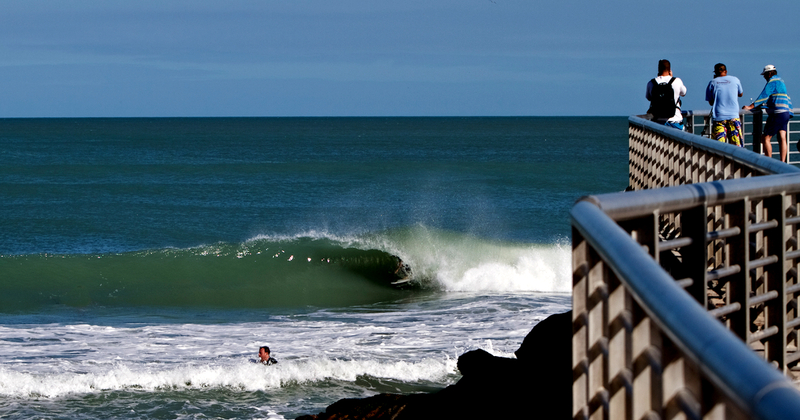 The worm reef at Sebastian Inlet leads by example. It shows us a way that Mother Nature is adapting to a man-made structure. Meanwhile, all over the world coral reefs are dying. Is someone or something trying to tell us something? Help us undo the damage. Let us know what you think about the revelations we shared in the article Structural Damage Redux. Leave a comment below to share your revelations. Make sure your comment has some structure, and it doesn’t damage our comment policy.